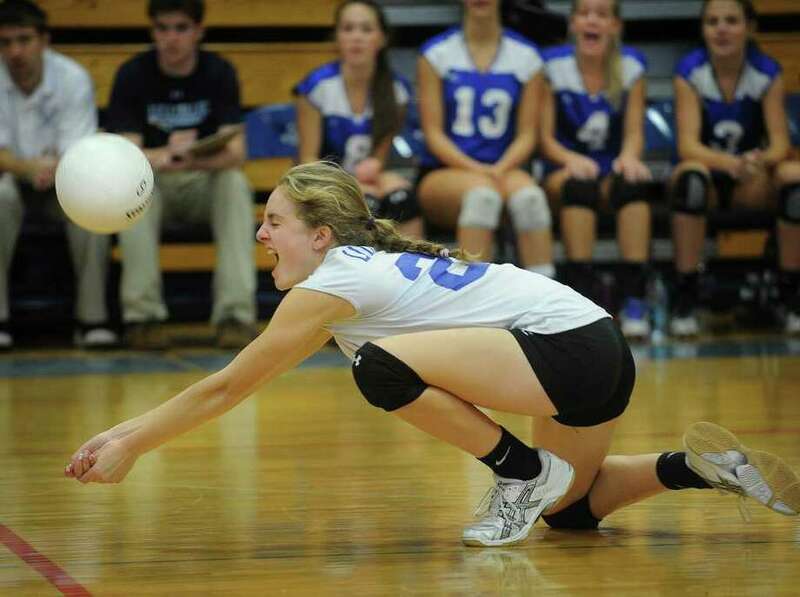 Ludlowe's Pauline Blatt digs the ball during their home matchup with Harding in Fairfield on Monday, October 3, 2011. At this point in the season for Fairfield Ludlowe girls volleyball coach Meghan Skelton, a win is a win. The Falcons won their second consecutive contest on Monday against Harding with a 3-0 (25-17, 25-18, 25-19) at Fairfield Ludlowe High School. "A `W' is a `W,'" Ludlowe coach Meghan Skelton said. "It wasn't pretty, but we'll take it." Ludlowe improved to 5-3 on the season, and overcame a week where the Falcons were upset by Stamford on Monday and routed by Ridgefield in three straight games on Tuesday. "It was a rough week," Skelton said. But Skelton's squad had to work harder than normal against the improved Presidents. Sandrene Brown led Harding with four service points, two kills and 12 digs. "They have a couple of good athletes," she said. "They're doing really well. They definitely made it competitive." The Falcons were led by Kelly Rotondo who had three assists, five service points and 26 assists. Emily Nelson also had 11 kills and eight digs and Kedi Curley had eight kills as well. "This was a confidence booster for us," Nelson said. "We need it right now." The Falcons also used the contest to get several of their younger players varsity experience and also improved their teamwork. "Our communication was a lot better in this game," Rotondo said. Despite the added effort needed for Ludlowe, it rarely trailed in the match. The Falcons capitalized on some of the Presidents' mistakes and also were opportunistic working hard to earn points. "Harding is very scrappy," Nelson said. "Every year they get better." Ludlowe takes on New Canaan today, before preparing for one of its most difficult weeks of the year. The Falcons travel to Greenwich on Monday and then take on crosstown rival Warde in a week and an improved Westhill squad on Oct. 14. "Next week is going to be even tougher," Skelton said. "We're moving into getting a consistent game against a consistent lineup." The players are aware of the stretch, and excited about the challenge that goes with playing some competitive matches. "Tough games are more intense," Rotondo said. "There's not going to be a team we can't beat," Nelson said. "But they're going to be good games."